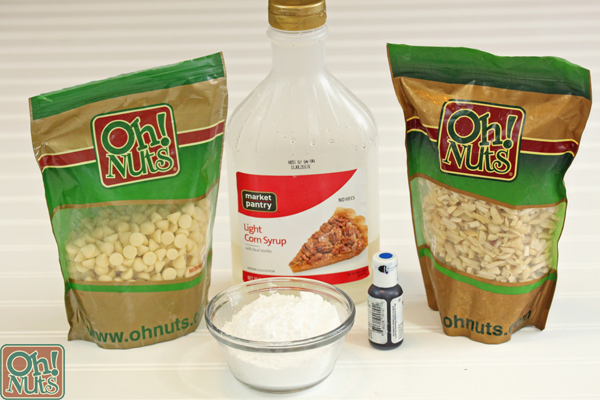 Over the years, we here at Oh Nuts have done a lot of fun and creative Hanukkah recipes, if I do say so myself. We’ve shared recipes for homemade chocolate gelt (so pretty!) and peanut butter fudge dreidels (so cute!). This year I wanted to take the ultimate symbol of Hanukkah, the menorah, and somehow turn that into a delicious candy as well. 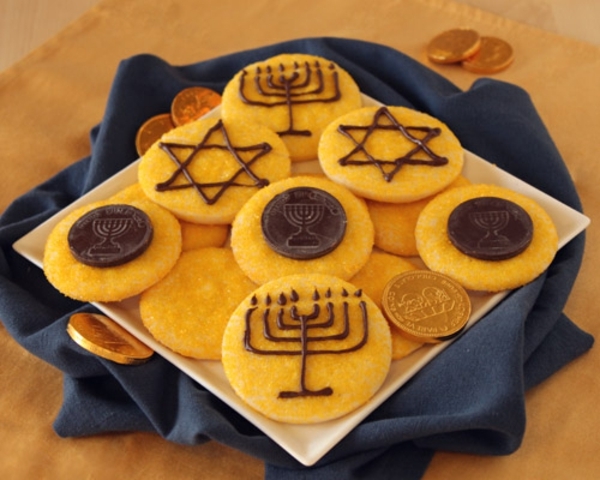 After a few brainstorming sessions and munching on a few too many chocolate coins, I came up with edible menorah candles. 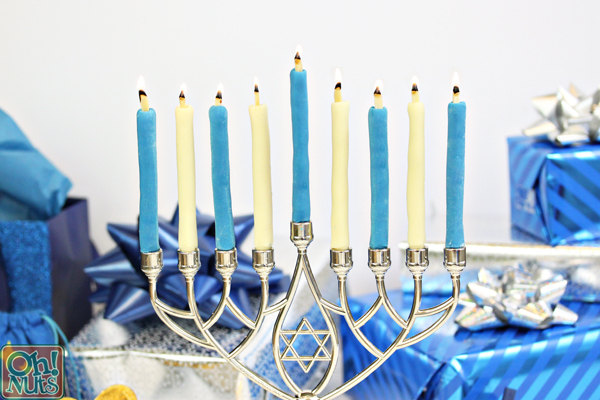 These candles may not look too different from your typical menorah candles, and at first glance you might not pay them much attention. 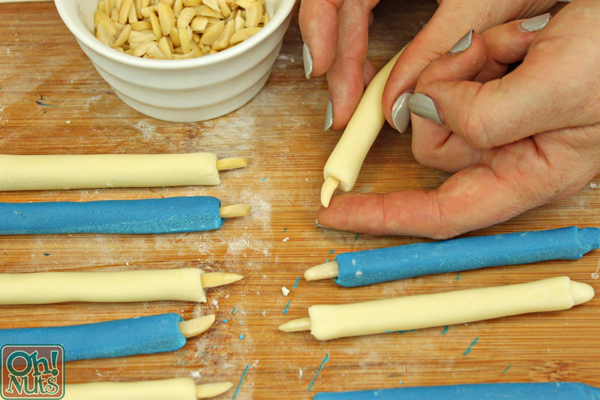 But these blue and white candles are hiding a delicious secret: instead of being made with wax and a regular wick, they’re made from white chocolate and slivered almonds. And here’s the best part: you can burn the almonds, just like a candle! The natural oils in the nuts will ignite, giving these sweet candles a totally realistic, seriously amazing appearance. You can use this general idea with fondant, or marzipan, or any other edible, moldable candy. 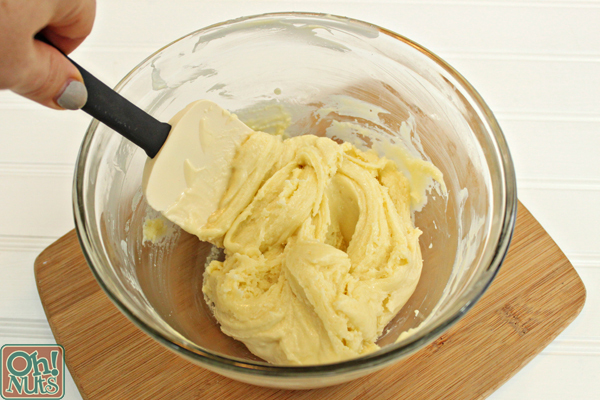 I chose this recipe because I think the white chocolate makes it taste better than your average fondant, but if you’re short on time, you can definitely take the pre-made fondant shortcut! The burning effect doesn’t last as long as a regular candle, but for novelty and coolness value, it can’t be beat! (Plus, the fact that you just pick it up and nosh on it afterward is priceless.) Read on to learn how to make these amazing edible candles! 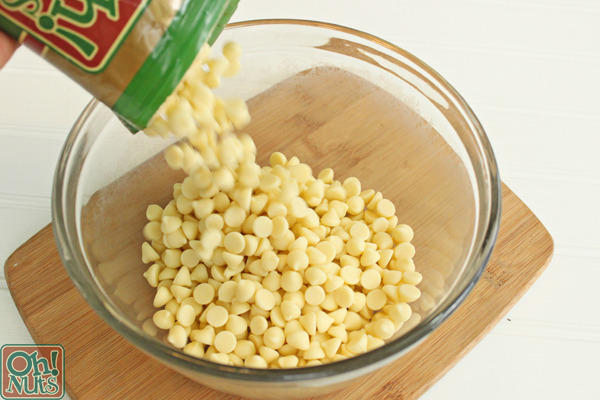 Start by melting the white chocolate chips. Pour them into a microwave-safe bowl, and microwave in 30-second increments, stirring frequently to prevent overheating and scorching the chips. Heat and stir until the chips are completely melted and smooth. 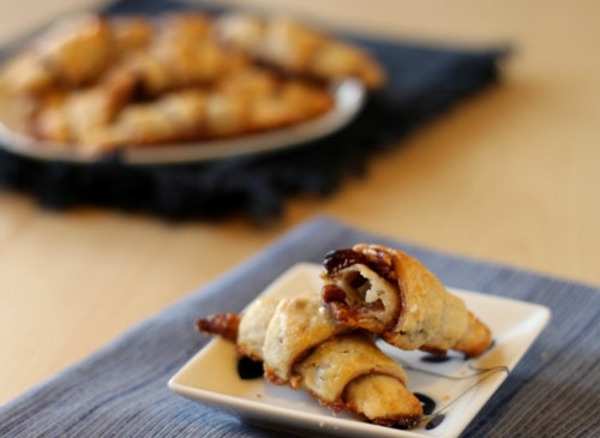 By the way, you can totally make this recipe with dark chocolate, as well. (Of course, you can’t dye the dark chocolate blue, but it’s a great alternative if you prefer the taste!) There’s just one slight tweak to the recipe quantities, so see the printable recipe below to read about how to adjust this for dark chocolate. One the chips are melted and smooth, add the corn syrup to the bowl. Start to stir the corn syrup and melted chips together. 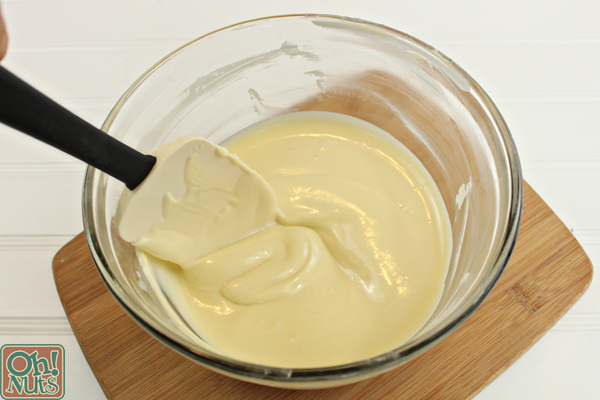 Soon after you add it, the white chocolate will start to thicken, and by the time you’re done stirring it should be a thick mixture with a texture almost like Play-Doh. It won’t look too appetizing now, but just you wait! Once you have that thick texture, wrap the candy in plastic wrap and leave it at room temperature to cool down and get firmer. Overnight is best, but even 2-3 hours of setting time should be enough if you’re in a rush. Dust your work surface with powdered sugar, and knead the candy until it’s soft and supple. It will be very stiff at first, and if you have difficulty, you can microwave it for a very short period of time, like 5 seconds, to soften it briefly. It should have a smooth texture like fondant when you’re done. 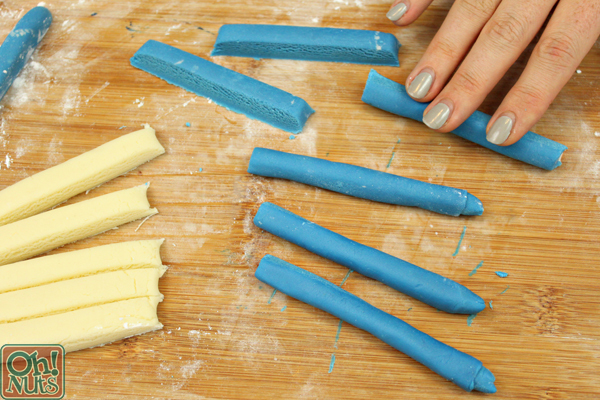 To make white and blue candles, divide the candy in 2 pieces. If you want to make more colors, divide it into as many different pieces as you’d like. 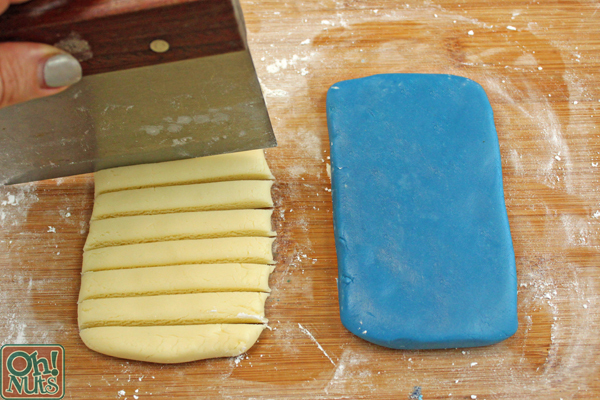 Add a few drops of blue gel food coloring to one half, and knead it in until you have a blue color you like. Gloves are a good idea here, so your hands don’t turn blue! Add more powdered sugar if necessary, if the candy gets too sticky. Shape each color into a thin rectangle, then cut them into long thin strips about the size you want your candles to be. 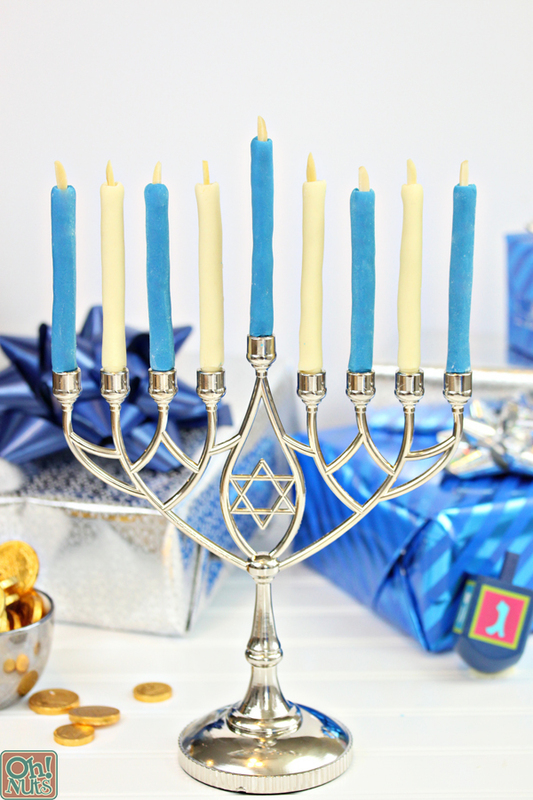 The exact size will depend on the size of your menorah and how you want your candles to look! Roll each rectangle between your palms, or on your work surface, until it becomes a round cylinder. Press the bottom of each into your menorah, to make sure it fits. 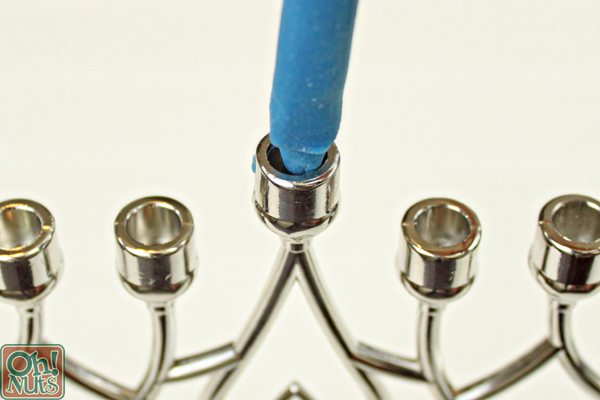 It’s a good idea to do this right after you shape them, because the candles will get hard again as they set, and you don’t want to wait until they’ve fully set before trying to fit them into the menorah. Press a slivered almond into the top of each candle to be the wick. Let the candles sit at room temperature to firm up, about 30 minutes. This way they’ll be stable enough to stand up in the menorah without bending or sliding around! Once firm, your candles are ready to be used! If you want to light the almond wicks, it’s best to use a lighter instead of a match since it can take them several seconds to catch fire. If you want to light all of the menorah candles at the same time, it’s easiest to have 2 people working on it to make the process faster. Hold a lighter flame to the almond and wait until it ignites—this can take 5 seconds or more, depending on the almonds. (Almonds with a greater oil content light quicker and burn longer, but it just depends on your batch, the age of the nuts, etc). They will usually only burn for about a minute, and then extinguish themselves, but it’s a cool effect while it’s happening! You can always remove a burned wick and replace it with a fresh almond if you want to re-use the edible candles. 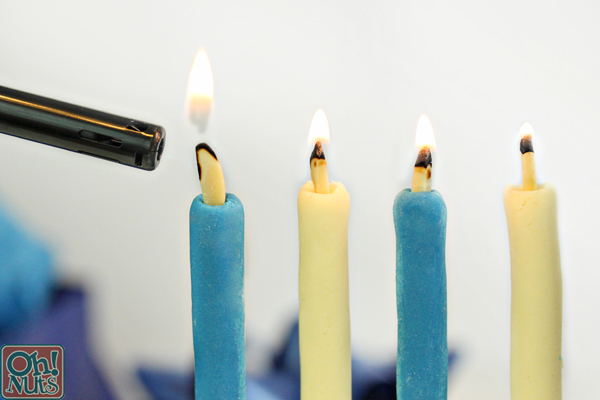 Menorahs aren’t the only way you can use these candles! Try putting them atop a cake, cupcakes, or any other dessert to make them fun and festive. Kids will love the idea of eating their candles after they blow them out! (Note that the burned almond doesn’t have a great taste, so it should probably be removed before anyone eats the candles.) Ready to make some candle magic yourself? There’s a printable recipe and pin-able image below. Enjoy, and happy Hanukkah! This recipe yields about 24 (5-inch) candles, but it can make more or less depending on the size of the candles you need. If you want to make these candles with dark chocolate, the procedure is the same but you will use ⅓ cup of corn syrup instead. Knead and roll the dark chocolate mixture in cocoa powder instead of powdered sugar, to prevent a dusty white appearance. Place the white chips in a medium microwave-safe bowl. Microwave in 30-second increments, stirring after every 30 seconds, until the chips are melted and smooth. Add the corn syrup and stir it in. 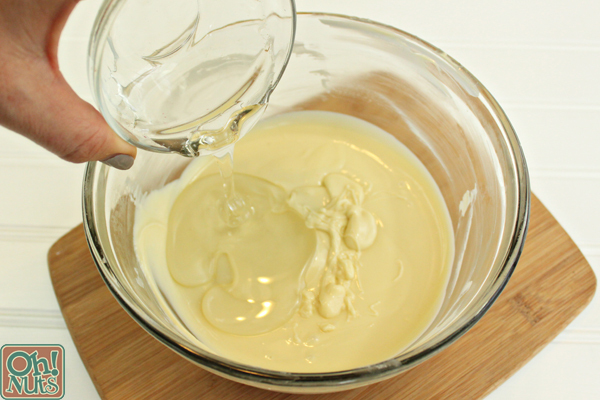 Soon after you add it, the white chocolate will start to thicken, and by the time you're done stirring it should be a thick mixture with a texture almost like Play-Doh. Wrap the candy in plastic wrap and leave it at room temperature to cool down and get firmer. Overnight is best, but even 2-3 hours should be enough if you're in a rush. Divide the candy in 2 pieces. 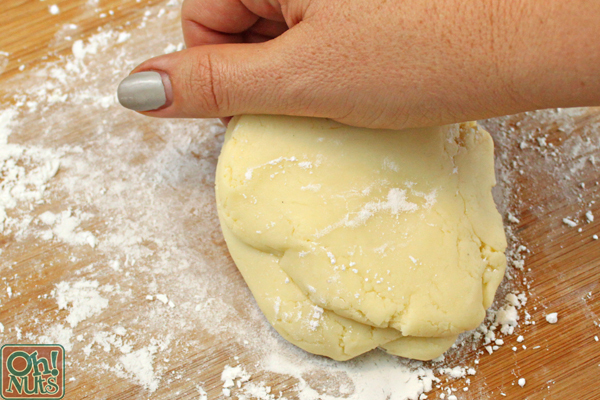 Dust your work surface with powdered sugar, and knead each piece until it's soft and supple. It will be very stiff at first, and if you have difficulty, you can microwave it for a very short period of time, like 5 seconds, to soften it briefly. It should have a smooth texture like fondant when you're done. 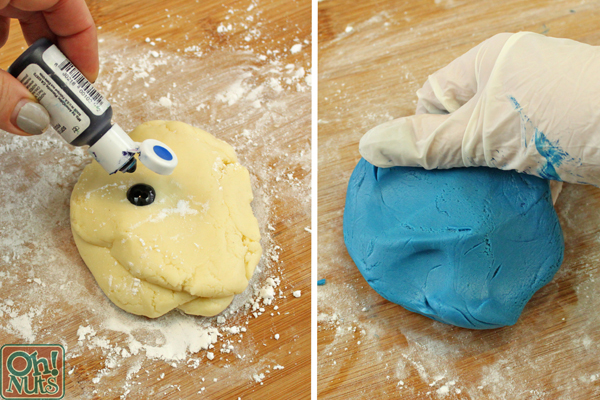 Add a few drops of blue gel food coloring to one half, and knead it in until you have a blue color you like. Gloves are a good idea here, so your hands don't turn blue! Roll each rectangle between your palms until it becomes a round cylinder. Press the bottom of each into your menorah, to make sure it fits. Press a slivered almond into the top of each candle to be the wick. Let the candles sit at room temperature to firm up, about 30 minutes. 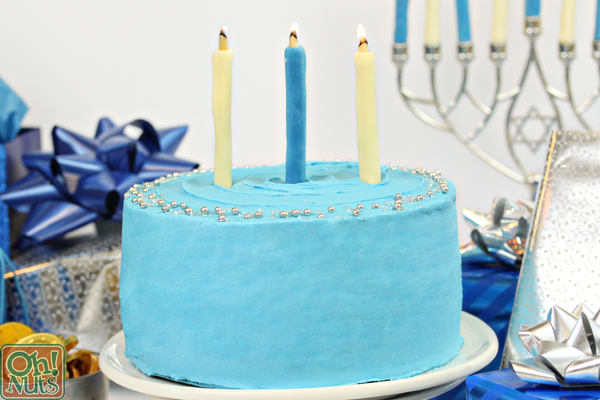 Once firm, you can put the candles into the menorah, or on top of a cake, cupcakes, or other baked goods! If you want to light the almond wicks, it's best to use a lighter since it can take them several seconds to catch fire. If you want to light all of the menorah candles at the same time, it's easiest to have 2 people working on it, since they do take awhile to light. Hold a lighter flame to the almond and wait until it ignites—this can take 5 seconds or more, depending on the almonds. (Almonds with more oil light quicker and burn longer, but it just depends on your batch, the age of the nuts, etc). They will usually only burn for about a minute, and then extinguish themselves, but it's a cool effect while it's happening! You can always remove a burned wick and replace it with a fresh almond if you want to re-use the edible candles. The candles can be kept in an airtight container at room temperature for several weeks, but they will get stiffer and drier the longer they sit.